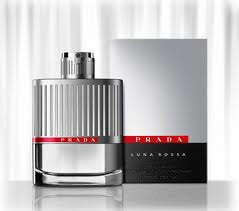 The new fragrance for men, Prada Luna Rossa was inspired by Prada's racing sailboat and team named Luna Rossa. The scent was blended by Daniela Andria and Prada Luna Rossa is described as a masculine fragrance that reinterprets traditional ingredients with agility. The scent covers a wave of aromatic freshness, conveying strength and dynamic energy with a noble and sensual hit. The top notes include Lavender alongside notes of bitter Orange, middle notes of aromatic Clary Sage and Spearmint Nanah and base notes of Ambroxan and Ambrette Absolute to give a woody amber signature scent. The bottle of Prada Luna Rossa was designed by Yves Behar who was inspired by modern, sleek and dynamic sailing boats. The design of the bottle, as you can see, projects both strength and sophistication. The fragrance Prada Luna Rossa makes an excellent Christmas gift for men who love fresh, sophisticated, woody aromatic scents. Prada Luna Rossa is available now at Prada, Myer, David Jones and Perfumery stores. Have you tried the scent Prada Luna Rossa before? What do you think of this scent?